You are on a holiday. You arrive in a new town. A brass band marches past, you follow (naturally). It unfolds into a magical street procession. You meet intriguing characters who take you on a journey in dance, music and theatre through the streets and parks, all coming together to tell a captivating story. It’s all at once both effortless and inspirational, yet vanishing only hours later, leaves a sense of pride, playfulness and celebration. It could be said that back stage is the same story, but more intense, and over a longer period of time. High quality and innovative outdoor arts rely on the collaboration between a wide range of players – artists, town councils, land owners, funders, local authorities, businesses, community groups – forging relationships to realise collective vision. Last week 35 outdoor artists, producers, managers, venues, landowners and funders (all interested in exploring building relationships) met up to explore potential connections, share experience, and get inspired by those taking the lead, with an event called ‘Exploring Partnerships to create outdoor arts’. The idea – to sow seeds for more work in Wales. This event was the first of three adventures by Articulture in 2014, a day out exploring the crafting of relationships to create outdoor arts in Wales. It took place at the new Wye Valley River Festival, born out of an exceptional alliance between the Wye Valley Area of Outstanding Natural Beauty, the renowned Desperate Men, Welsh and English artists, and local communities. The festival, which took place over May, followed a narrative shaped by the environmental and cultural issues along the River that came out of a National Theatre Wales style ‘Assembly’, the community collectively creating the story. 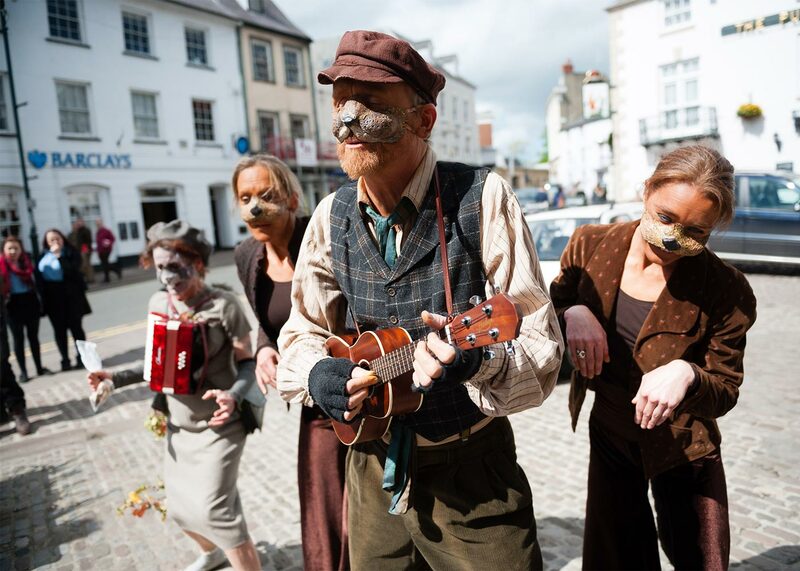 The result – the story of Ratty, the Wye water vole, leader of the Creatures’ Republic of Wye (CROW), who is on the run from predatory prosecutor Mink and Judge Wild Boar. The twists and turns of the chase unfolding in a series of community and arts events down the river. This included the first of Articulture’s small- scale outdoor arts commissions – a thought provoking, dynamic dance piece by Chloe Loftus Dance that resonated with the tensions of the debate on the issues. Speakers at the partnership event included: Desperate Men; Wye Valley AONB; Arts Council Wales; Catherine Paskell; NoFit State Circus; Mr and Mrs Clark; Marc Rees and Phillippa Haynes. Attendees include Natural Resources Wales and National Trust. Post event the Articulture team stayed on for a weekend of festival frolics, following the dramatic and emotional scenes in the courtroom as Ratty was tried, with tom foolery and laughs combined with real experts speaking passionately about the river, its fauna and wildlife, and a mini festival in Llandogo on the Sunday, a heavenly valley filled with local families enjoying the spectacles including wire walking across the river and fire finale. New international festival bursaries + Summer sessions begin! First calls for Outdoor Art Commissions 2019 now live!